Well, I have spent over 13 hours over the past two days trying to get my classroom up and ready. We have meetings both tomorrow and Monday, Open House Monday evening, and students come on Tuesday. Needless to say, I am in full panic mode, but I do not regret going to Jamaica in the least! We all have them; ugly areas in our classrooms. I have a few suggestions for some creatively camouflaging them. Problem: Ugly, but necessary file cabinets. Solution: Buy a roll of colorful gift wrap. 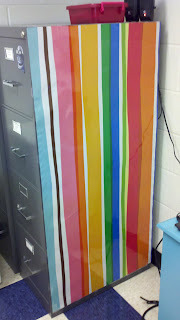 Laminate a strip to fit the side of the file cabinet. 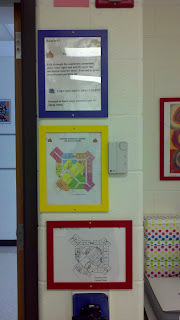 Add some magnets to hang schedules, lunch menus, etc. Enjoy the view! 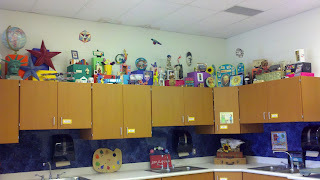 Problem: Not enough display areas for artwork. 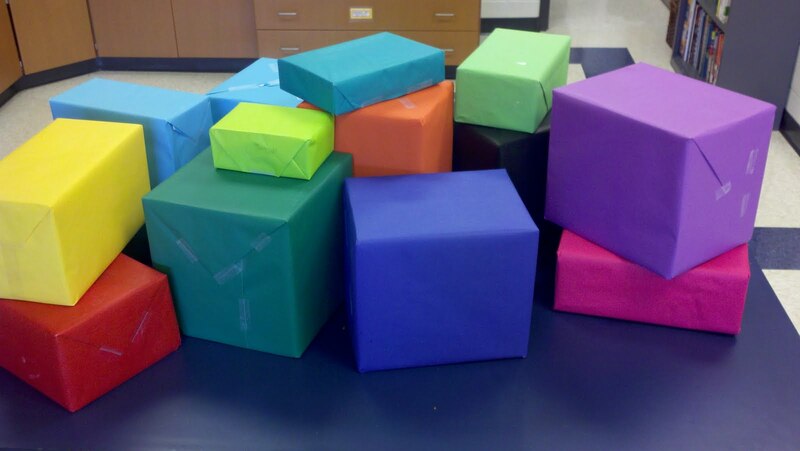 Solution: Wrap some boxes with rolled paper to make display cubes. 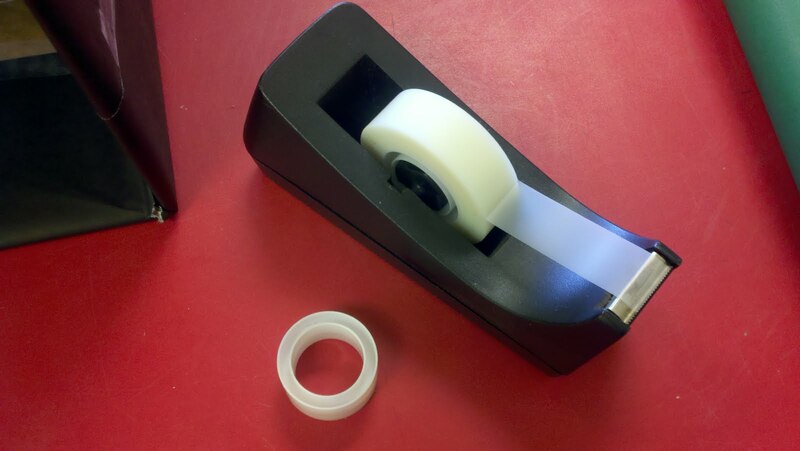 Side note: see that little plastic ring from the used up tape roll? Save that guy and use him for stamping in to clay. It makes great owl eyes! Once you have a bunch of cubes, use them to elevate artwork or use as a backdrop. And here I have used the cubes to help fill our showcase, which only has five shelves. 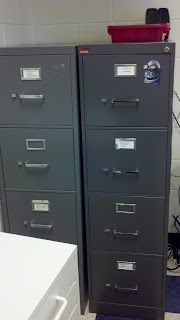 Solution: Buy some colorful (and inexpensive) frames from Ikea and permanently mount those documents. 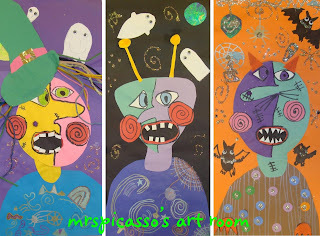 Make them in to art. Ok, that's a stretch, but they still look better than before! 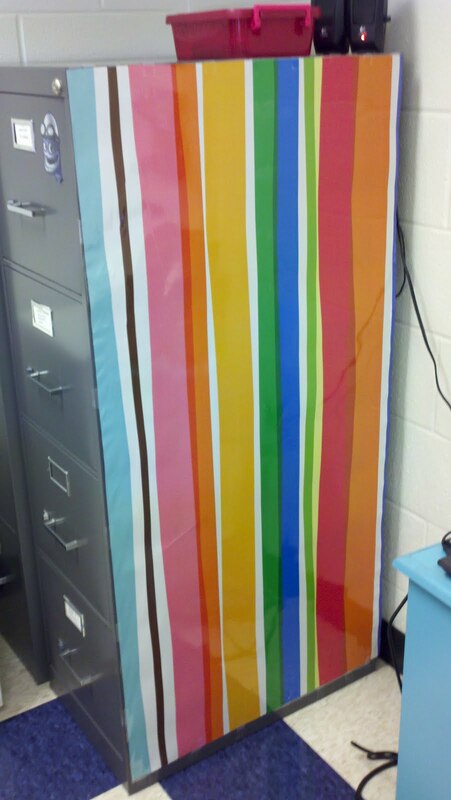 Problem: Constantly changing bulletin boards. Solution: Very simple- put up a black background so that it never has to change. Simply add your bulletin board pieces on top. All of my boards are black, always. Well, I hope some of those ideas are helpful! Do you have any tips to share? 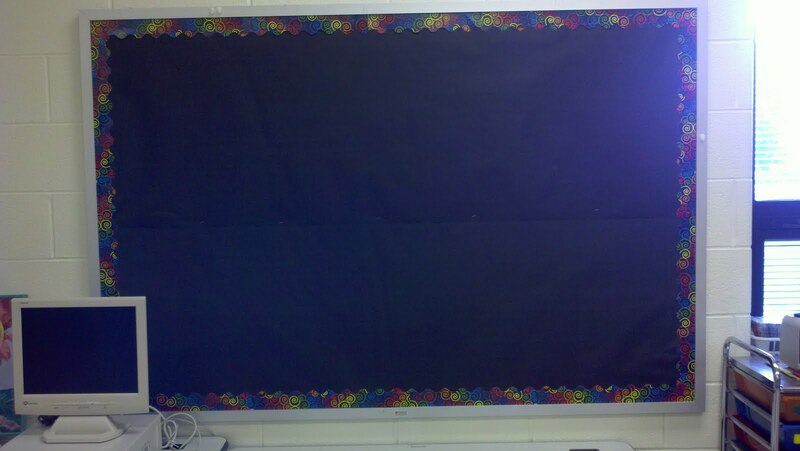 Only 3 bulletin boards to go until I have my room ready. Wish me luck! 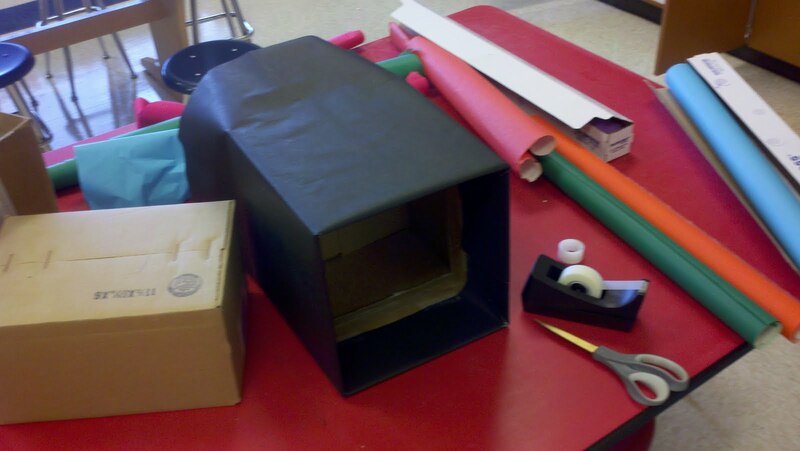 I like the idea of black bulletin boards. I used dark blue on all my bulletin boards and it made the classroom look cohesive and it also made the work on the boards the feature. I love the cardboard box idea and the frames for permanently displayed signs. 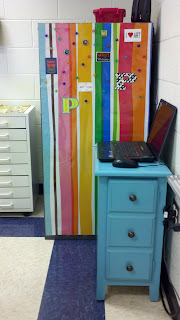 For some of my bulletin boards I've used fabric. 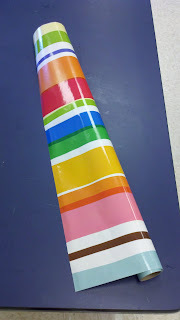 I got the idea from another art teacher who said she'd rummage through clearance fabrics to find simple ones on clearance and then keep them up for a few years! Plus they don't fade, unlike some cheaper grades of rolled paper. I have a lot of bulletin boards in the hallway and I love using black backing on them too. It makes the artwork pop! I absolutely LOVE the box idea, but I have one question - what do you do with them when they are not in use? I seem to run out of places to put big stuff. In my district, you have to be careful with fabrics you choose because of the fire marshal. They must be sprayed with fire retardant. I stick with darker backgrounds usually. :) Thanks for all the tips. 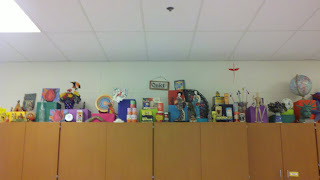 Phyl, the boxes stay on top of my cabinets until the art show rolls around. I also have a set that I keep for the showcase. I wrap them with the bottoms open so I can slide them inside one another to save room. These are great tips!! What did you use to stick the laminated wrap to the file cabinet?